While my website is aimed at portable air compressors, sometimes they just don’t cut it. Some offer outstanding PSI numbers, but are only good for a short burst of high-pressure air. Others take too long to refill, or have a tank that’s too small. I suppose you could theoretically buy several of these which will allow you to cover all situations you might find yourself in, but that would just be a waste of your money. Portability is nice, but the primary function of an air compressor is to get the job done efficiently which is why you sometimes have to go with the stationary option. Going into the subject of stationary air compressors would require me to create an entirely new website which would only deal with them, so I decided to pick just one for you. Since it’s the only one, I’ve made sure it’s an excellent choice. This is a heavy-duty compressor there is no doubt about that! Just by looking at it, you can tell it’s an absolute beast. The 230V motor delivers 5hp and is equipped with overload protection which ensures this compressor will last a long time. The construction is cast iron which makes it extremely durable, and it’s able to deliver a massive 14 CFM at 90 PSI along with a maximum pressure of 175 PSI. Thanks to all that power, you will be able to use multiple tools simultaneously. Two-stage compressors, unlike their single-stage counterparts have two cylinders which compress the air in two stages. Check out my informational articles on air compressors for a detailed explanation on each type. 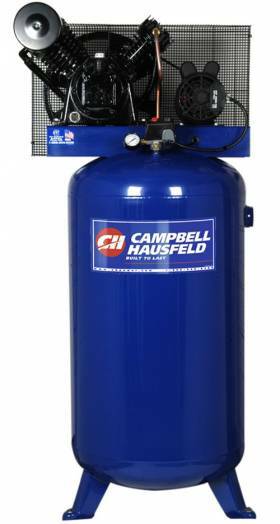 This unit is equipped with an oil-lubricated pump which, (in my opinion) is the best choice for a heavy-duty compressor like this one. The length of the pump life is 10,000 hours. Oh, and I almost forgot to mention the tank which is a massive 80 gallons. Even though it’s immensely powerful it is not designed to run on a 100% duty cycle, what you can expect is a duty cycle of about 75%. Given the power and size of the tank, I doubt you will ever need a number that high. Now, the number of horsepower is not always the best indicator of how powerful the compressor is, but you absolutely can’t argue with 5hp. Having that kind of power on an air compressor is enough to spin the Earth in the opposite direction (so to speak). If you are going to be doing work that requires a lot of air power this unit is ideal. Thanks to the specs mentioned above, you can now power nail guns, impact wrenches, air sprayers, sanders, and plenty of other air tools that require lots of PSI. Measuring at 31 x 41 x 78 in. and weighing over 400lbs the Campbell Hausfeld HS5180 is big and heavy, but it’s supposed to be that way. Luckily, the orientation of the tank is vertical in order to save some space otherwise you might not be able to use this one where there isn’t much floor space. It’s not exactly cheap either, but it is an investment in your work so I think it’s worth every penny. There is simply no substitute for oil-lubricated pumps when it comes to heavy-duty compressors. High performance means there will be a lot of friction and, as a consequence a lot of heat. Oil-based pumps not only help keep everything lubricated, but also keep the operating temperature down as well. Oil-based units also experience less wear and tear, and they tend to last longer when compared to oil-free compressors. Checking the oil level on this air compressor is easy thanks to the oil sight glass. I think the very fact this is the only stationary as well as the only two-stage compressor on my site speaks volumes. I chose this one because it’s the very best, and I don’t want you to waste time and money looking for other units that are no match for this one. If you are a professional looking for a compressor you can fully rely on at all times, visit Amazon and get it today.